RSL staff would very much like to know which parts of the Library readers prefer to use. Please let us know at https://www.surveymonkey.co.uk/r/rsl-spaces-HT18. Your views will inform future development of the RSL’s spaces. We currently have a trial to a new Earth Sciences database. EarthDoc is EAGE’s online geoscience database which contains more than 62,000 event papers and journal articles. EarthDoc gives you the opportunity to consult many years of research and a vast expanse of technical knowledge. All articles and papers cover the main fields of study within Geoscience, such as: Geology, Geophysics, Near Surface, Petroleum engineering, Reservoir and Production Engineering. The trial will run until Thurs 15th February. 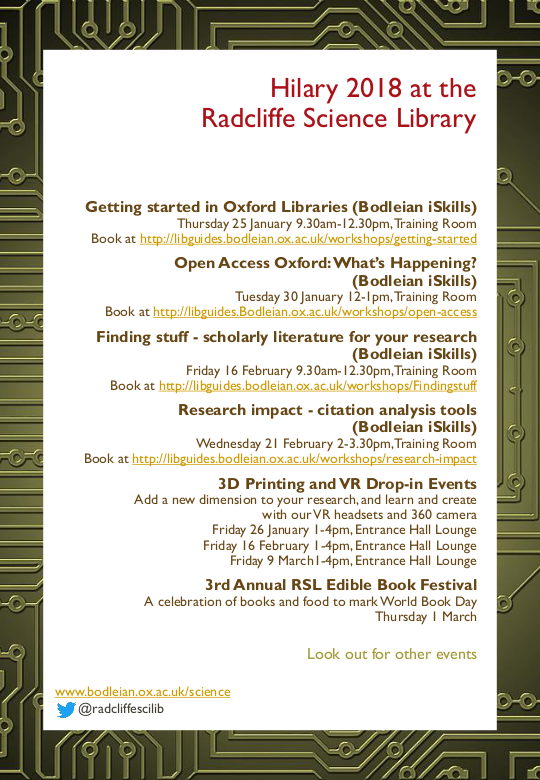 Please contact Andrew Kernot in the Radcliffe Science Library (andrew.kernot@bodleian.ox.ac.uk) or Elizabeth Crowley in the Earth Sciences Library (elizabeth.crowley@earth.ox.ac.uk) if you have any feedback.